Looking after a pet takes a lot of care and attention. Can you help Dorothy Dog and Tilly the Cat find the things they need to stay healthy and happy? Draw lines to match Tilly and Dorothy to the right items. Why not Download the Dorothy Dog Puzzle right now and see if you can help her out. 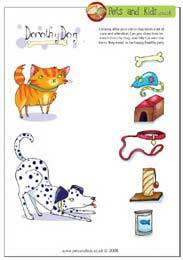 This puzzle is aimed at 3 to 7 year olds and is a great way to help children learn about petcare whilst developing their recognition, matching and sorting skills. All of our puzzles are supplied as a pdf so you'll need to have Adobe Acrobat installed on your system. If you haven't Google it and you'll find lots of places and instructions on how to get it.